This summer, Tribeca’s Kitchen owner Andy Koutsoudakis got the sidewalk café he had long wished for. Armed with his newly issued two-year city permit, he was proud, he said, of how those nine brand new tables, with their 18 place settings, dressed up the outside of the 200 Church Street eatery he had opened four years ago. Then, on Aug. 29, came a letter from the Landmarks Preservation Commission and its director of enforcement, Lily Fan. Koutsoudakis’s permit had been revoked. 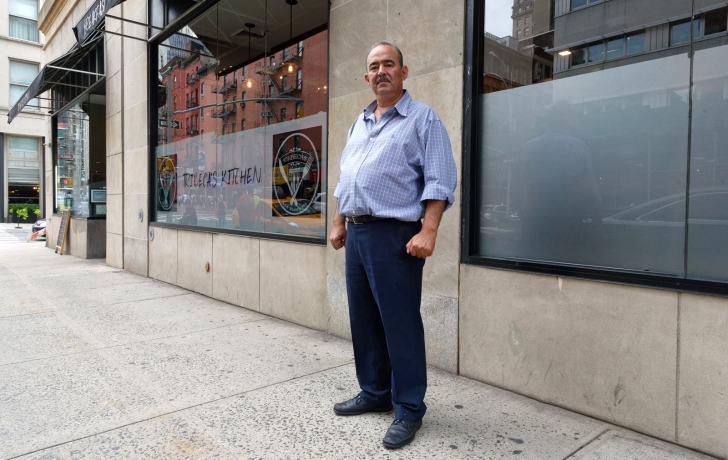 The agency that permits and regulates sidewalk cafés is the Department of Consumer Affairs, and the process leading up to its June 21 approval had been routine. At the Feb. 6 condo board meeting of 52 Thomas Street, the residential building above the restaurant, minutes show that the board agreed to give its consent. That included Abraham Sutton, the restaurant’s landlord, who as owner of the building’s commercial spaces has a seat on the board. He had signed the Consumer Affairs consent form. David Hirsh, Sutton’s lawyer, signed a form required by the Landmarks Preservation Commission. (The LPC has a say in the matter only because the sidewalk is in a historic district, not because an historic preservation issue is at stake.) In April, Community Board 1 unanimously voted its approval. No one came to object. Koutsoudakis said he spent more than $30,000 on furniture and the application process. But just days after Consumer Affairs issued its permit, the agency officially warned Koutsoudakis that it might take it away. Suddenly, the condo board was raising objections. In an “intent to revoke” letter to Koutsoudakis, Consumer Affairs said the board claimed Sutton “did not have the authority to execute the Landowner’s Consent.” They wanted proof. In response, Koutsoudakis sent a deed, an affidavit from Sutton, a condominium declaration and offering plan, and the minutes from the board meeting among other documents. He felt confident he had satisfied the agency. In the end, Consumer Affairs never ruled on the matter. Instead, the agency told the Trib in a statement, the issue was “moot” because it had deferred to a revocation judgement by the Landmarks Commission, where a condo board member also was opposing the permit. In an email to the LPC’s Lily Fan, Joseph Augustine, a commercial litigator and the board’s treasurer who was not at the Feb. 6 condo board meeting, went into detail about issues over noise and vibrations that he blamed on the restaurant’s exhaust system on the roof. (Koutsoudakis disputes this, saying the problem lies with the building’s construction.) Augustine also told the LPC that the condominium “in no way” authorized the landlord representatives of the commercial spaces to sign the city consent forms. Members of the condo board contacted by the Trib, including Augustine, did not respond to questions for this article. In an affidavit submitted to Consumer Affairs, Sutton, the landlord, said it came as a “complete surprise” that the condo board was now claiming that he or his representatives were not authorized to sign the consent form. (Sutton did not respond to a request for comment.) But the LPC form stipulates that the signature of an officer of the board is required. The absence of that signature is ultimately what rendered the permission invalid, the LPC told the Trib in a statement. Whether that will ever happen now remains in doubt. As the new tables and chairs sit neatly stored in the restaurant basement, Koutsoudakis continues to hope they will again see daylight on Church Street. “You know how I felt taking them out?” he said, seated at a booth in the back room of his restaurant. The usually cheerful restaurant owner looked down at his tightly clasped hands and shook his head. At first the words wouldn’t come.